Not lucky enough to live in a warm, fertile locale with a garden year-round? When temperatures start to dip below 50 degrees, most fresh herbs start to wither and brown. But these lengthening fall nights don’t have to signal a return to packaged or bottled herbs. 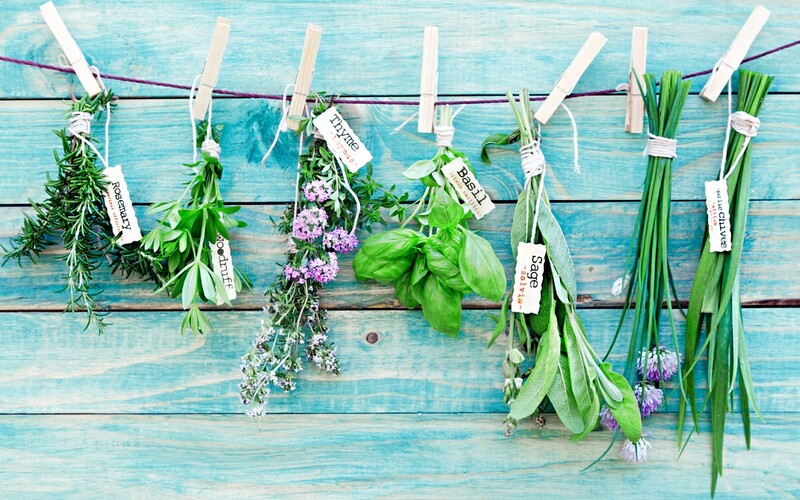 If you’re serious about bright flavor, try these DIY techniques to keep herbs around longer. If your outdoor herbs are still going strong, you may be able to transplant a section to an indoor pot situated in plenty of natural light. Sturdy herbs like mint, oregano, thyme, marjoram, parsley and rosemary tend to do well indoors. For best results, try not to disturb the roots too much, digging deep. Transplant herbs well before the first frost, after which many plants start to shut down for the winter. Be sure to add compost or natural fertilizer to the potting soil, to reinvigorate the plant. Unsuccessful transplant? No problem. Grow new plants from seed or greenhouse starts. Bonus: For about the same cost as a package of store-bought fresh-cut herbs, you can grow and snip all winter long. Leafy herbs, such as basil and cilantro, don’t grow as well indoors. And they taste like, well, dried leaves when dehydrated. Fast fix: Wash, dry, and then freeze whole leaves in zip-lock freezer bags. To lock in more flavor, make an herbal “paste” (like pesto), blending fresh herbs and olive or avocado oil. Freeze the paste in cubes. One standard ice-cube equals about one tablespoon. The herbs’ fresh flavor won’t last forever—something is lost by freezing—but it is still any easy way to infuse soups, stews or stir-fries with taste. Use within a month for best results. Place the bag in a warm, dry place, such as on top of a refrigerator or high kitchen shelf. Gently shake the bag every few days to keep herbs from clumping. When herbs are completely dry (usually in 1–2 weeks), store in an airtight glass jar or zip-lock plastic bag away from sunlight. Bonus: These make beautiful holiday gifts in small, decorated tins or glass jars! 1. Infuse oil (olive works well) with strong herbs such as rosemary. 2. Make a big batch of herb-rich soup. Freeze portions for lunch. 3. Experiment with different herbs in your favorite pesto recipe. 4. Add chopped herbs to breads or savory muffins—or cooking beans. 5. Make herb-infused simple syrup for tea, sparkling water or cocktails. 6. Blend fresh herbs into butter or vegan butter alternatives. Freeze in small portions. Another great holiday gift!